According to Compass, the MKS cleats are interchangeable with Time ATAC cleats and, though not interchangeable with Shimano SPD cleats, can be mounted on SPD-compatible shoes. Folding bicycles often come with folding pedals. Folding pedals reduce the width of the folded bicycle, but not as much as quick-release pedals, like the MKS Lambda with Ezy Superior coupling. Here’s what you’re looking at in the picture: the pedal, the adapter that screws into the crank, the washer that MKS recommends using with any crank with a step down to the crank threads, and the right crank of my Bike Friday tikit, which happens to have that step down. 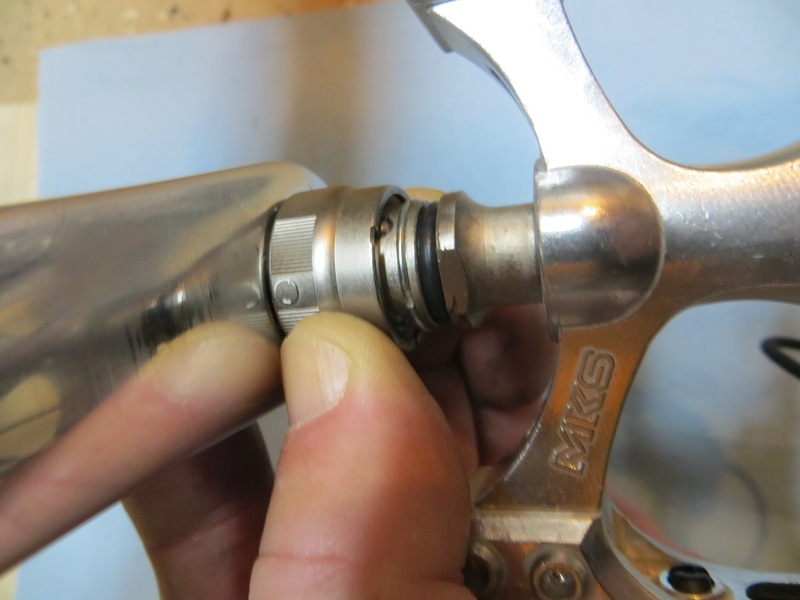 I slid the washer over the threads of the adapter, greased the threads and screwed the adapter into the crank arm. 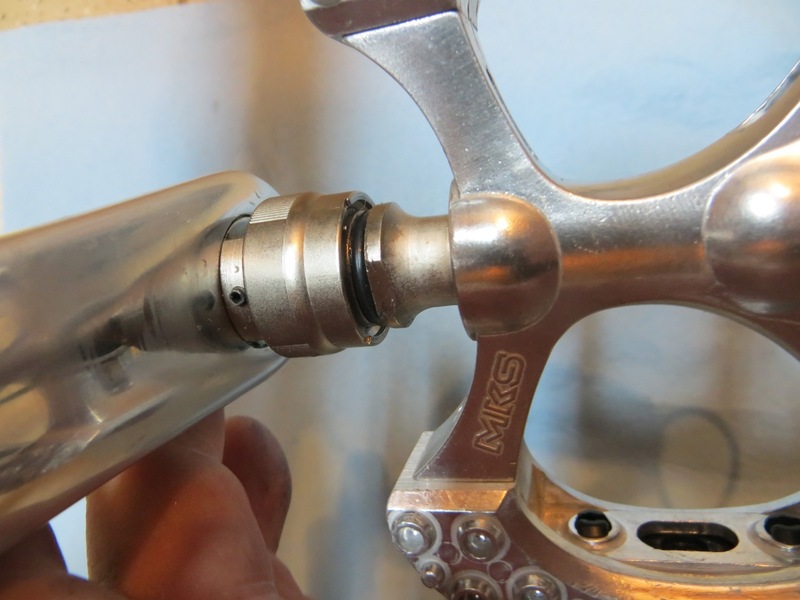 MKS is right: you can’t install the adapter with a regular pedal wrench. I used a 15mm cone wrench to do the job. 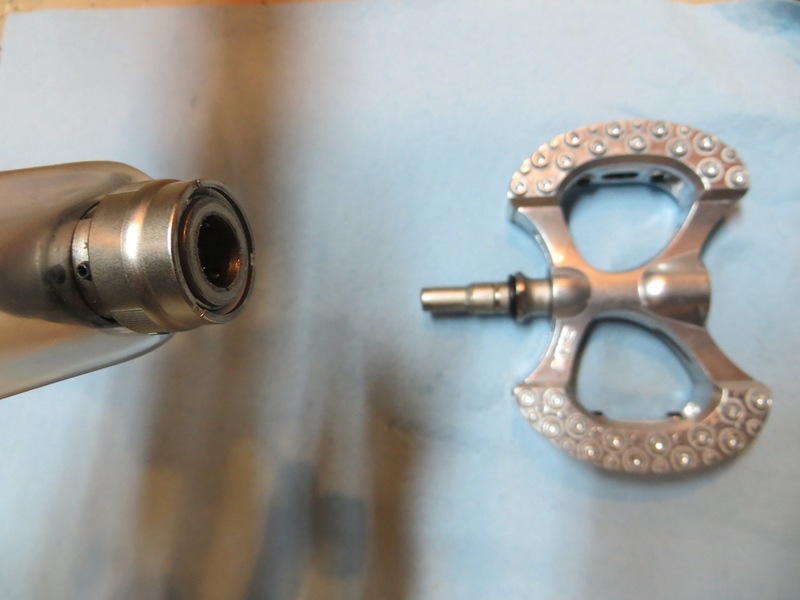 Note the black stopper pin between the adapter’s outer cap and the crank arm. Ready to attach the pedal? The outer cap is spring loaded. Twist the cap until the dot on the cap lines up with the black stopper pin. 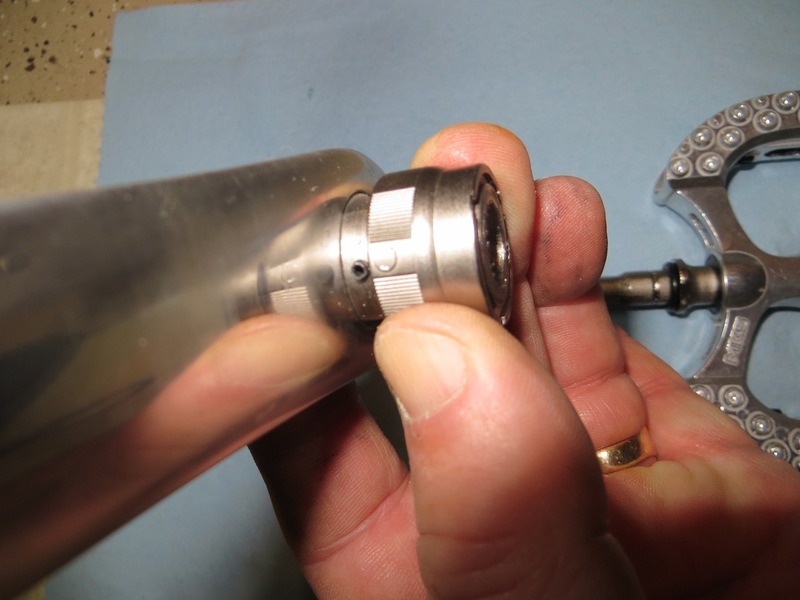 Push the outer cap toward the crank, and hold it there. Push the pedal into place. Release the adapter cap. This is what the pedal looks like after installation. 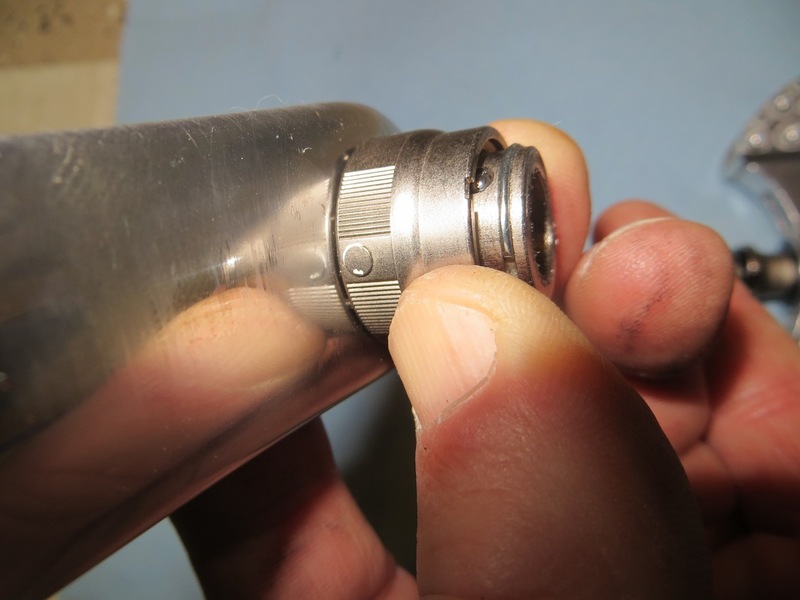 When you release the outer cap, it springs away from the crank and rotates on the lower portion of the adapter. You’ll know the pedal is properly installed when you hear a click upon releasing the cap. Note that the black pin and the dot on the cap of the adapter are no longer aligned. You’re ready to ride. And so am I, with one set of MKS Lambda pedals and two pairs of Ezy Superior adapters: one set for the Bike Friday tikit and the another for the Dahon Bullhead. This entry was posted in Bike Friday tikit, Dahon, Equipment and tagged Ezy Superior, installation, MKS Lambda, pedals, quick release pedals. Bookmark the permalink. I had neither seen nor ever heard of quick release pedals. They look very well crafted. Nice post…thanks for the idea and please followup with a review after beating them up on the road. 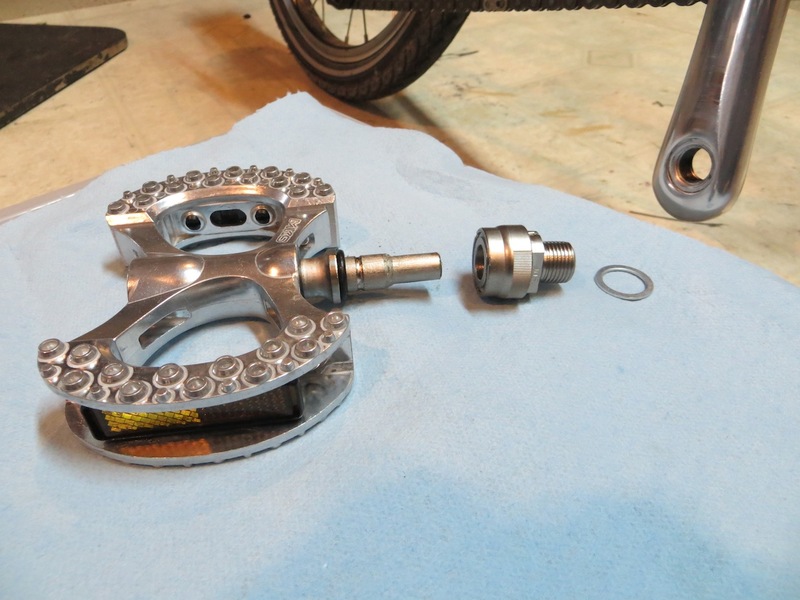 By necessity, a quick-release pedal is more complicated than a standard bicycle pedal. However, MKS makes this model, the Lambda, in both quick-release and standard styles. I have the standard pedal on my Fisher commuting bike, and it provides outstanding foot support when I’m wearing my Sperry Topsiders. The quick-release style felt exactly the same on my Dahon Bullhead–much better support than either of the folding pedals I’ve used (MKS FD-6 and SunTour). I’ll be sure to provide an update on the quick-release mechanism when I’ve added the requisite mileage. Can you fit BMX-style pedal straps to these? Are they heavy? No way to attach toe clips. Might be able to attach Power Straps, which don’t have a cage, but I recommend these for free pedaling with whatever shoes you might have on.